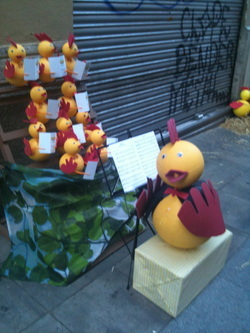 A street display at the Festa de Gracia in Barcelona. This page is more like a personalized FAQs page. These opinions are my own and do not represent those of the department or even of other faculty members. I encourage you to talk to other faculty members and other graduate students for their opinions on these matters. What courses should I take if I am interested in health communication? I’ve had a number of graduate students interested in health communication ask me what classes to take. Our School offers health communication classes every year, and there are other opportunities to take relevant coursework in health sciences/public health and psychology . At least several of these classes should be included in your program of study. Having a strong grounding in qualitative and/or quantitative methods is also a must. Quantitative methods will be especially helpful if you hope to receive funding to pursue your research interests at any point in your career. I personally prefer students to have a reasonable grounding in both qualitative and quantitative methods. I also recommend persuasion and/or social psychology theory courses since most of health communication involves some degree of social influence, whether it is focused on improving physicians’ communication skills or improving any population’s health behaviors. Organizational communication theory courses provide an excellent grounding for the more organizational aspects of health communication. (Check out an invaluable new handbook in this area: Organizations, Communication, and Health, edited by Tyler Harrison and Elizabeth Williams.) In terms of cognate/minor areas of study, consider looking into programs such as public health, psychology, public administration (for organizational applications), or anthropology (for medical anthropology). How do I write a dissertation proposal (or research paper)? How long should it be? How many references should it have? The length of a dissertation proposal is commonly (not always) in the range of 35-50 pages. This is usually enough space to complete a solid literature review and to present your blueprint for your research procedures and data analysis. It is worth noting that your research methods and analysis sections need to be quite explicit. For example, you need to know how many subjects you will be using and you need to include the instruments or measures that you will be using in the study. In a qualitative study, you will want to be sure to have a copy of interview guides and/or a letter that indicates that you’ve been granted access to the population you will be using (from someone in authority in a corporation, or a school district, etc.). Research papers vary in length depending on what your professor requires. If you don’t know, ask. If you get an answer like, “Do a thorough treatment; it will take as long as it takes,” I would advise that longer is probably better. It may be helpful to note, however, that most conferences and most journals set a limit of 25 pages (whether this number includes references, tables, etc. varies by conference or by division). References. As a general rule, the more, the better, particularly when it comes to current research on a topic (within the last 5 years). As a graduate student, it is important to read a lot, especially on topics that you may investigate further later on (i.e. your dissertation). However, from a journal editor’s point of view, referencing every single study done on a particular topic is not necessarily useful. Most editors want to see a judicious use of citations– usually two or three of the best or most representative of each of the topics you’re talking about. Therefore, there’s really no clear number to give on this. One helpful tip might be that you should always be sure to cite the most influential and best known studies in a particular area. This will help build credibility. Will you be on my committee? Will you be my advisor? I am selective about graduate committee assignments. I base my decision on whether a student’s research area (eventual dissertation/thesis topic) is in my area(s) of interest/specialization (namely, health communication or intercultural communication). It also helps if I’ve had you in class, especially if you’ve done well. Master’s students who are taking comprehensive exams place less of a demand on committee members, so I am more likely to accept these assignments if your area of interest is somewhat different from my own (although it becomes more important that you’ve had a class with me). Any methodological approaches to your topic are fine with me, as long as your methodology is well-suited to your research questions. I do my best to advise students on the most appropriate classes to take to prepare them to do the type of research projects (e.g. dissertations) they have planned for the future. I steer graduate students toward interesting and rewarding research experiences outside as well as inside of our department. These experiences can be a very enriching part of graduate education and can be rewarding in a variety of other ways. I am committed to helping graduate students plan and conduct the best possible theses and dissertations. If a graduate student is equally committed to the process, the end product should result in peer-reviewed publications. I provide timely and detailed feedback on thesis and dissertation chapters. When graduate students work hard to write chapters and “turn around” revisions according to our pre-negotiated timeline, I am equally committed to reviewing those materials promptly (generally within 2 weeks) so students have the best possible chance of graduating when they want to. I provide plenty of one-on-one mentoring time to help students prepare to build a solid vita in preparation for going on the job market. I also spend a lot of time advising my students on how to navigate the academic interviewing process. I am dedicated to my students’ success and spend a great deal of time preparing students for success on all dimensions of their future academic career. My ultimate goal for my doctoral students is to do my best to make sure that they are 1. Offered an academic (or professional) position after their graduation that is well-suited to their interests and talents and 2. Prepared to become active and recognized scholars in their field. I expect that my advisees will do well in their coursework. This is not just measured by your final grade but by your overall performance in class. Although not everyone is a “talker,” everyone can be engaged with the material and demonstrate that engagement both verbally and nonverbally. Similarly, not everyone will immediately grasp all course material. However, I expect that students will seek help (from the course instructor or from me) so they get the very most out of their educational experience. An eagerness to learn is paramount. I expect my advisees to write well. Even if you enter the program with less-than-stellar writing skills, I expect advisees to actively seek to improve those skills. All papers turned in for any class as well as drafts of thesis or dissertation chapters must be edited before being submitted. I recommend finding an “editing buddy” (who will probably be in your cohort) to trade papers with for editing and proofreading. Even seasoned professors generally need a fresh pair of eyes to look over a paper to make sure that there are no “dumb” errors and to check the organization and flow of a paper. I expect my advisees to play well with others. This isn’t so much about popularity as it is about the ability to make connections with your peers. The person sitting next to you in class today is going to be your colleague after you both graduate. Over the span of your 30+ year career, you will find your network of graduate student colleagues to be truly invaluable. Therefore, because one of my goals is the long-term success of my advisees, I want to see you connect with your fellow grad students. This means being collegial to others in class and it also means being willing to socialize outside of class. There is an enormous amount of information that is disseminated at informal gatherings that you will miss if you consistently say, “I’m too busy to go to happy hour or a party." You don’t have to be a drinker, but you do have to be friendly! I expect my advisees to be ambitious. This can involve any number of behaviors, including submitting papers to regional, national and international conferences, serving on faculty research teams (and not just my own), assisting faculty in writing manuscripts for publication in exchange for co-authorship, attending workshops to develop teaching skills and strategies, and/or doing internships with health-related government agencies or non-profits to build career-related real-world experiences. I want my students to graduate with impressive C.V.s, which will eventually make the job search experience much easier and more gratifying. I expect my advisees to be good departmental citizens. No matter what type of job you get after graduation—academic or private sector—you will be expected to be a team-player and help out from time to time. The most frequent and helpful forms of service grad students can do are meeting with prospective grad students visiting the department, meeting with or helping to entertain visiting scholars, including job candidates, and attending research presentations sponsored by the department. The entire School looks bad when a visitor has open holes in their itinerary or if they deliver a research talk to a mostly empty room. The great thing about these tasks is that you will meet some fantastic people and learn interesting material that you might not have had the chance to learn otherwise. I expect my advisees to be “mentorable.” This doesn’t mean that I expect you to follow through with all of my recommendations or suggestions or that you won’t disagree with me. However, an advisee that doesn’t trust that my advice is given with their best interests in mind probably needs an advisor who is more compatible with his or her view of the world—or the communication field. Can I borrow a book? Most faculty (myself included) are happy to lend materials that would be helpful to you, particularly if you are an advisee or current graduate student. However, I (along with everyone else!) have experienced a steady drain of materials that go out but don’t come back. I am trying to establish a habit of having people fill out index cards listing the materials you’re borrowing, but sometimes I forget. Please remind me that you need to give me a list (if I forget to ask you for it) and please return these materials promptly– no more than two weeks from the date you borrowed them. What’s the process involved with completing the Master’s/Doctorate? After completing your first year of coursework, it is time to begin thinking about choosing your committee members. (See the official Bulletin of the university for information on the composition of committee members; a certain number need to be Communication faculty, and a certain proportion must be tenured faculty). Choose your committee wisely. It helps if they like and respect each other personally and will work well together. (This is generally not a problem in our Communication department but is often an issue elsewhere!) Your committee members should mostly be actively researching in your area of interest. This maximizes your chances that your committee members will be well-versed in the area you want to investigate and will be able to help you design a sound study. You probably will have had most of the professors on your prospective committee. If not, consider taking one of your next semester’s classes with that person(s). When you feel that you have more than just a passing acquaintance with your professors, ask to make an appointment with each of them. In that appointment, explain to them where you are in your program of study (”I just started my second year of coursework”) and what your area of interest is. Also, make sure to tell them which of their areas of interest are relevant to your own interests and future work. Then ask if they would be interested in serving on your committee. If you are a Master’s student, you might also want to mention whether you will be doing a thesis or taking exams. If you are a doctoral student you will have three primary defenses. First, you will meet with your committee after you pass the written portion of your preliminary exams. Second, you will meet with your committee to discuss/defend your prospectus. Finally, you will defend your dissertation. The oral exam following your written preliminary exams is probably the most nerve-wracking of your meetings. This is the defense that is designed to determine whether you are adequately prepared to move on to write a dissertation. Talk to your committee chair before the defense to get some idea of any areas of weakness in your written answers. Before the exam begins, your committee chair will ask you to step out of the room so the committee can decide whether your performance on the written portion of the exam warrants continuing on to the oral exam. If the answer is no, they will tell you which portion of the exam has to be re-taken (usually all of it) and the earliest date that the re-take can be scheduled. If the answer is yes, the oral exam will begin. At the start of your oral exam, be prepared to address these areas of weakness by stating how you would like to add to or revise your written answers. Some people have even brought brief handouts with them to distribute to the committee to aid their “clarifications”. Your committee members will ask you questions about your written answers, both to clarify what you’ve written and to question you more closely to assess your knowledge. They may (or may not) also ask you to apply your “textbook” knowledge to hypothetical, “real-life” or research situations. You will be asked to step out of the room after the exam (a maximum of 2 hours) so that committee members can discuss whether you have passed your oral exam. If the answer is no, you will have to re-take your exams (you have one more chance!). If the answer is yes, congratulations! If you’re a Master’s student, you can order your cap and gown for graduation– and if you’re a doctoral student, you can begin to develop your dissertation proposal. After you pass your orals, you will write a prospectus for your dissertation. Once your advisor determines that it is ready to go to the rest of your committee, you will schedule a defense of your proposal. This is generally not a terribly high-stress meeting. If you did a good job with your proposal, the defense will probably look and feel more like a brainstorming meeting. Everyone is there to make sure you have a solid, well-designed study that is likely to be successful. There is often more work to be done before you actually begin your dissertation (or Masters thesis), but this work is a vital investment in your success. Your final defense is of your completed dissertation or Masters thesis (if you have selected the thesis option). Generally speaking, your advisor will not let your dissertation go to your committee until it has a high chance of being deemed acceptable by the rest of your committee members. The defense, then, usually takes the form of a stimulating and often intense conversation about your study. Obviously, you might be asked some tough questions. But at this point, you are truly the expert in this subject matter and it is quite unlikely that you will fail. How can I do well on my preliminary/comprehensive exams? Preliminary or comprehensive exams are designed to test the breadth and depth of a student’s knowledge; they are also designed to assess whether a student is academically prepared to begin the dissertation (specifically or generally). I recommend that students make an appointment with each committee member to discuss the range of literature the committee member will hold you responsible for. Many committee members will permit some negotiation of the type of question that you will be asked by that particular faculty member. Speaking only for myself, I like to do as much as possible to make sure that the question will be relevant to a student’s preparation for the dissertation (or future career, in the case of Master’s students). However, please do not expect that your committee members will tell you explicitly what the question will be. We are happy to help you prepare, but it would be unfair to give you the exam in advance. The most common mistake I have seen in written exams is NOT ANSWERING THE QUESTION. There are a couple of manifestations of this phenomenon. Written exam questions from each faculty member are usually made up of several related questions. Sometimes it is easy to overlook one part of the question. The other thing that seems to happen often is that a graduate student provides a lot of information that is not required by the question. Perhaps this is because a student has been surprised by some (or all) of the question; perhaps the student prepared for a slightly different question. This seems to result in a student providing lengthy, but unnecessary information, then citing length/time restrictions as the reason why the question could not be answered thoroughly. I recommend that when you receive your exam questions that you re-write the question as a list of sub-questions (this probably shouldn’t appear in the text of your written answer). This will serve as a check-list when you have completed writing the answer; this will guard against the possibility of omission. Also, simply resist the temptation to provide information that is not called for by the question. Contrasting two communication theories does not necessitate an exposition of the history of the field, for example. In summary, whatever appears in your written answer should correspond directly to some part of the question, and all parts of the question should be answered. There’s a scholar visiting the School/Department– do I have to go? I’m really busy! Regardless of what job or career you are in, there will be events outside your area of interest that you will have to attend, even if it is inconvenient or you are very busy. Whether you are a doctoral student planning an academic career (at a research institution or a teaching college) or a Master’s student planning a career in the private sector, showing up at events sponsored by your organization is critically important to your success (tenure, promotions, collegial goodwill). It shows that you are actively engaged with the culture of the organization. It is especially vital that you attend presentations by scholars who are visiting from the outside world, whether invited as part of a colloquia series or as part of a national job search. It is really embarrassing to our program to have an important scholar give a presentation to an empty room. In other words, do it for us (your professors, the department, etc.)! You gain exposure to ideas that might not be well-represented among the faculty in the School/department. These might be great ideas for dissertations or theses or independent research projects. Being conversant in a wide range of ideas, even at a relatively superficial level, can make or break a future job interview. Departments everywhere are diverse, and you will be meeting and talking with a wide variety of scholars, including ones outside of your area of concentration. These are people who can vote for or against your candidacy for the position. Being able to schmooze about lots of kinds of ideas is a distinct strength. You can make great contacts with outstanding scholars in the field. Most of these folks are interesting and personable and more than willing to talk about their research interests as well as your own. Plus, you never know when you’re going to go for an interview at that person’s institution. Being able to say, “I heard your presentation when you came to the University of Miami” is a great “in” that other candidates probably wouldn’t have. I’m ABD and I want to get the heck out of here. What can I do to speed up the process of doing my dissertation? However, a dissertation takes a lot of time for a number of very good reasons. First, you have to complete a really solid research proposal– which means doing a very thorough literature review (which entails lots of library research, a lot of reading of research articles, and a lot of organized writing) as well as developing your plan for conducting the research, (which entails collecting research instruments and deciding on all of your procedures) and finally, an analysis plan for the massive quantity of data you will surely collect. You also have to account for how long it will take your committee chair to read and revise your proposal and drafts of your dissertation. It is common courtesy to allow two weeks reading time at each and every stage. We can often do it in less time, but don’t get upset until at least two weeks have passed. It is not at all uncommon for a dissertation (and a proposal) to go through three or more drafts. Remember that our primary interest as faculty members is that you generate a respectable piece of research. If we suggest revisions, please don’t make us feel like the “bad guys.” We want you to finish. We also want to feel good about the research that you have generated. It’s also in your best interest because your first publications are likely to be from your dissertation. If you can’t publish your dissertation research because if was executed (or communicated) poorly or incompletely, it will be more difficult for you to make tenure at your first (academic) job. So what CAN you do to expedite the process? Use your past research papers (from your coursework) and/or the published work of your advisor (if appropriate) as a starting point. That’s a good start for a literature review. Keep your research design SIMPLE. Your dissertation must constitute a significant contribution to our knowledge about a phenomenon, but that doesn’t mean that your study has to be complex. Talk to your committee chair about how you can design a “clean” study once you settle on an area you want to investigate. Always complete the revisions you are asked to do in a very thorough fashion. Make sure each draft has been edited and proofread by you AND a second person. Remember, the fewer the number of drafts, the fewer weeks they take to read– which means you get done sooner. Effective time management skills are paramount in the dissertation process. One advisee made himself time cards and punched in every time he sat down and wrote and punched out every time he stopped for any reason (lunch, a nap, errands, teaching). He held himself to a goal of writing a specified number of hours every day. I thought it was a brilliant way to manage time. When I am faced with a large writing task, I break it down into much smaller component tasks. When I hit a wall, I do mindless work that still advances the overall goal: I format a bibliography, write up quantitative results from my SPSS printouts, or organize my literature in EndNote. I also try to finish my workday by cleaning up my space and making sure the next day's work is clearly set up for myself. That makes it so much easier for me to get started again. I wanted to talk to you so I stopped by your office. I know it was not your office hours, but when can I see you? It’s best to make an appointment with me. Because I am juggling multiple research projects as well as responsibilities as Associate Provost, I am often out of the office. Email is the best way to reach me. Do I need to have (a) publication(s) before I can get hired as an assistant professor? Well, let’s put it this way: It sure wouldn’t hurt. If you are planning to work at a research institution (where the typical division of work is half teaching and half research), it will be important to show some promise for a strong program of research. At a minimum, you will want to have at least a handful of conference papers presented, most of which should be in your declared area of specialty. It would also be very helpful if you could co-author one or more publications with a faculty member. Some graduate students have asked me about publishing the papers they write for class. Papers you do for class (especially those you get high grades and positive evaluations on) can be a nice start for conference papers, but probably won’t be eligible for publication in a national or regional journal if they are non-data manuscripts. State journals, however, may be interested in student work. In fact, there are some state-based journals like the Atlantic Journal of Communication (New Jersey), and the Kentucky Journal of Communication actively seek work by graduate students. You can try to turn class papers into publications by designing and executing a study based on what you have learned from your literature review. If there is a faculty member who shares your interest, you may want to have them look over your research plan and give you assistance if needed. I’m not interested in doing research. When I get my Ph.D., I want to teach. Do I still need to get published in order to get a job? Maybe, maybe not. Research jobs are harder to come by, and there are lots of qualified, intelligent candidates for these jobs. When you apply for a teaching position, remember that you will be competing against all of the people who didn’t get a research position in addition to the people who simply want to teach at the college level. Every university wants to hire the best person for the job, and when a hiring committee looks at everyone’s vita, conference papers and publications do stand out. At the very least, if you want to teach, you should be engaged in pedagogical scholarship. We have a lot of fine opportunities in the department (and the university) to be engaged in this type of scholarship. You will also want to be sure that you take every opportunity to teach as many different classes as possible, that your teaching evaluations are very high, and that you have prepared a teaching portfolio to take with you on interviews. All of these things will help demonstrate your dedication to teaching. My professors keep circling every little mistake that I make on research and reaction papers. Shouldn’t they be reading for content instead of picking on the details? I tried to proofread it, but I can’t catch every little error. Everything you turn in to your professors should be as near perfect as it can possibly be (unless otherwise specified by your instructor). It should be typed, edited, and proofread and checked against the current APA manual for style of referencing, etc.. Here’s my advice: Pair up with a grad student friend/buddy/colleague (preferably also a Communication student) and provide editing and proofreading services to each other. So many papers I see from graduate students have obvious mistakes…punctuation errors, spelling, basic grammar. Having someone help catch these errors will improve your grade and your informal reputation as a good writer. Getting into the habit of having someone else in the program read your work before you turn it in (or submit to a conference, etc.) can have another positive outcome: other people learn about what you’re interested in. You just might find a future co-author or collaborator. If the manuscript you’re working on is a thesis, dissertation or proposal, NOT having a graduate student colleague edit and proofread your work can have a serious unintended consequence: the length of time it takes your committee chair to read and recommend revisions. Moreover, it is likely that you will have to submit more versions of your manuscript because it takes any editor several reads to catch all the problems (if there are a lot of them).